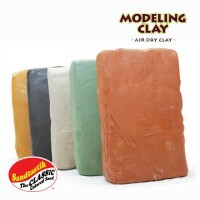 Sandtastik® Air Dry Modeling Clay Superior Strength - Self-Hardening - Natural Clay Sandtastik® Air Dry Modeling Clay is premium quality, natural, self-hardening clay. Its exceptional plasticity and ultra fine grade allows for excellent detail versatility. Air cures to superior strength and durability. It will not crumble and has minimal shrinkage. It can be carv..